There are various ways to display additional information on-screen - beside the map display (see Chapter 1.2). 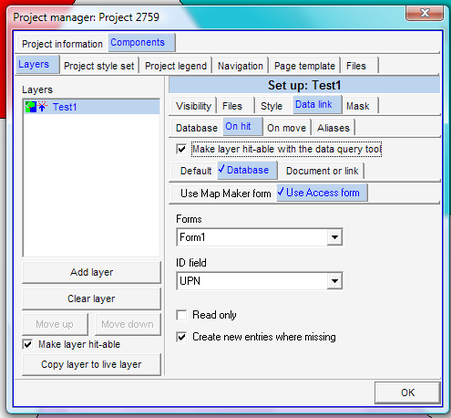 Information of the database (attribute data) can be retrieved either in tabular form, when clicking on the unit, or as a thematic, coloured map. The procedures are explained in Chapter 4.3. It is possible to link an external document, which refers to a geographical unit, and have a specific document displayed, when clicking on the unit. An ‘external document’ can be a Word document, a graphic file, a PDF file or similar, including the possibility to edit the document after being loaded. For example, when clicking on a parcel, LUPMIS will then show the application form, the permit issued (see Chapter 8.4 for Permit Tools), a photograph or similar. The item in the id, style or label field must have an equivalent file name (without extension). For parcel references, the easiest is to have the UPN (see Chapter 7.7.1) as the display label and files with the file name of the UPN. 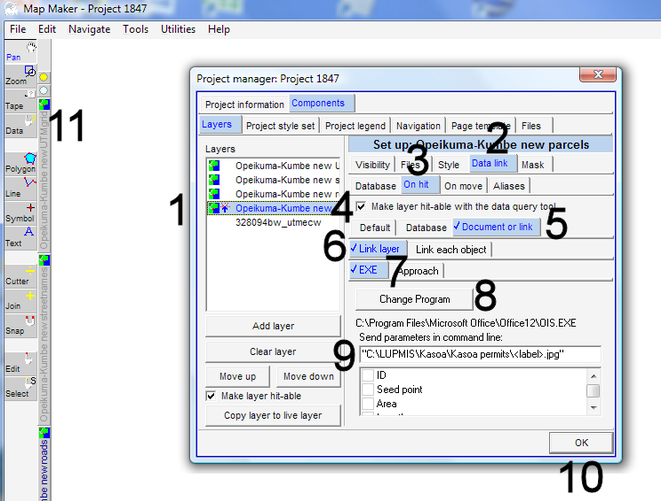 You will have to select the Data-tool on the toolbar left (11) and click on the unit of interest. The location (path) of the program file might be different due to different installations and operating systems. 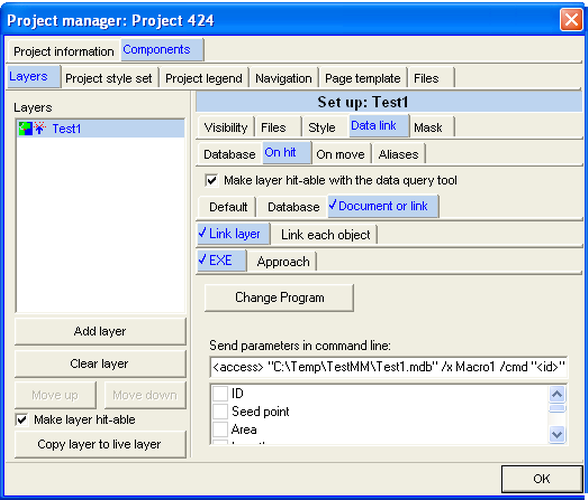 After you have set up the link reference, you better save it as a project (Main menu > File > Save project as), because any copying to the live layer or temporary other hit-definitions will delete the original link reference. See also Annex 17.3 for examples. <access> "Databasefile.mdb" /x Macro1 /cmd "<id>"
<access> "C:\LUPMIS\Permits\Kasoa_Permits.mdb" /x Macro1 /cmd "<id>"